Pretty much what title says, I am thinking it was tied to the trigger which was changed with the server reset. Still broken. But now the Northwest area is connected to the Central Glacier area and back skipping the West area entirely. 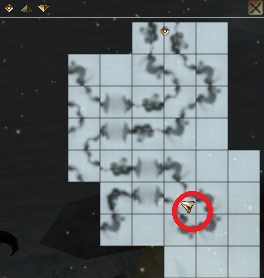 The red circle indicates the broken transition which used to be connected to Icereach: Glacier: Central (where the flame trigger was), the little pin label in the north part of the map indicate connection the Icereach: Glacier: Northwest area. The West Glacier area is an inbetween area between Central and Northwest...or it used to be anyway, now you can only get to it by teleportation since the red circled transition is still broken and the transition from the Northwest area has been re-routed to the Central Glacier area.